Storage Explorer is a great tool for managing contents of your Azure storage account. You can upload, download, and manage blobs, files, queues, and Cosmos DB entities. Additionally, you may gain easy access to manage your Virtual Machine disks, work with either Azure Resource Manager or classic storage accounts, plus manage and configure cross-origin resource sharing (CORS) rules. Storage Explorer also works on public Azure, Sovereign Azure Cloud, as well as Azure Stack. Let’s go through some example scenarios where Storage Explorer helps with your daily job. 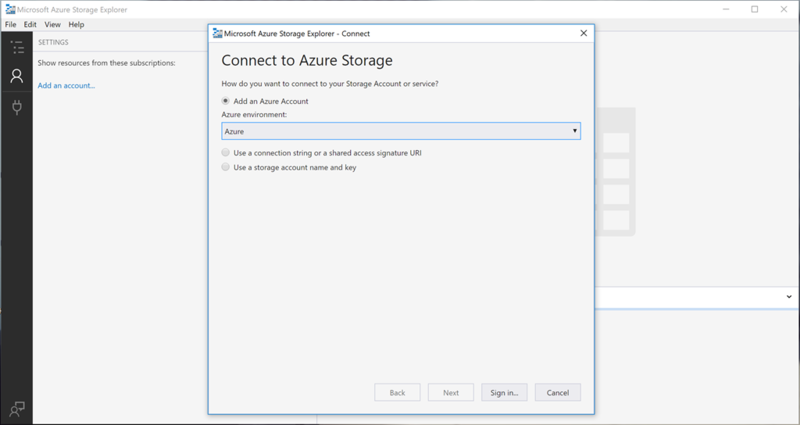 To get started using Storage Explorer, sign in to your Azure account and stay connected to your subscriptions. If you have an account for Azure, Azure Sovereign Cloud, or Azure Stack, you can easily sign-in to your account from Storage Explorer Add an Account dialog. 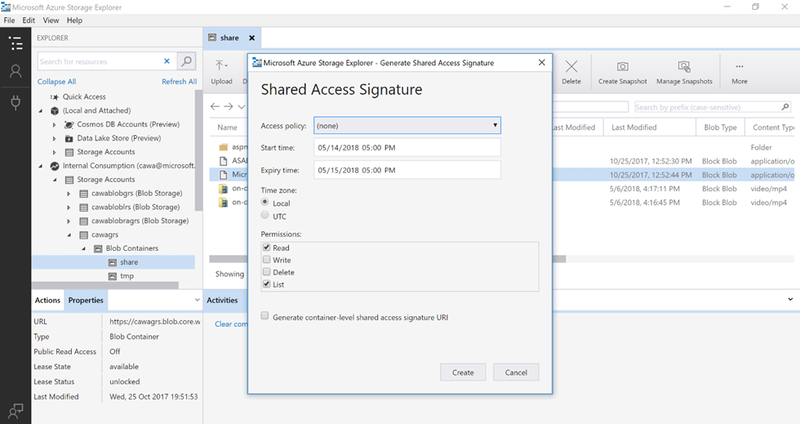 In addition, now Storage Explorer shares the same sign-in component with Visual Studio. 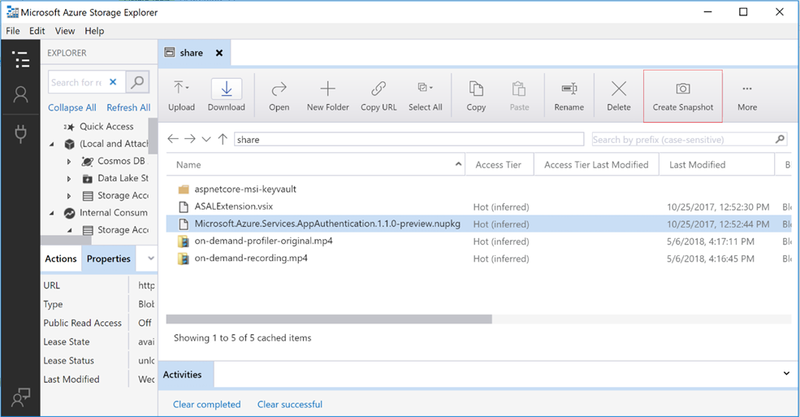 This means you only need to sign-in once from Visual Studio or Storage Explorer, your developer tools will stay connected to your Azure subscriptions. Blob storage is a convenient way to store various types of files. You might have many photos related to an event that you want to be saved in blob storage, so your website can access it. Or you might have a very large VHD file you want to backup using blob storage. Storage Explorer ensures you can upload and download blobs efficiently while maintaining data integrity. We will continually improve the uploading and downloading performance to provide you even better experience. Sometimes you have data that’s frequently access by your web application, such as the media resources of your website front page. Other times, you might have short-term backup and disaster recovery datasets, which don’t need to be accessed very frequently. Wouldn’t it be nice if you pay for storage access cost based on what you need? In the latest Storage Explorer, you can leverage the Storage platform capability to configure access tiers for a Storage Account – hot, cold, or archive. 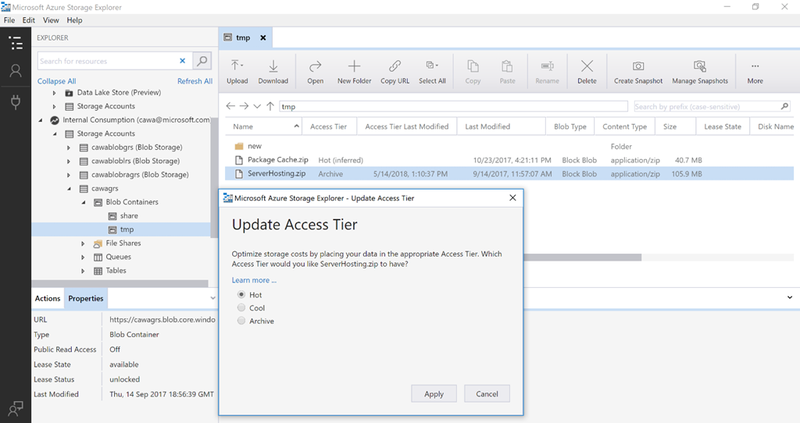 Learn more about Storage access tiers at Azure Blob storage: Hot, cool, and archive storage tiers. Have you ever been in the situation where you need to share a large file with someone else, but the file is too large to be attached in an email? With Storage Explorer, you can quickly upload the file to a blob storage, then obtain a temporary access link to the file and send the link to your colleagues or friends. You can configure how long before the link will expire, and access control policies on the link. Easily and securely share content with Storage Explorer! Before modifying a file, you might want to make a backup copy of the existing one for future references. Storage Explorer enables you to backup blobs and file shares as it appears at a moment in time. You can create snapshot for each individual blob. For file shares, the snapshot is taken at the entire share level. Check out these features today! We believe technology should empower every individual to work with efficiency and high productivity. As part of this release, we are proud to deliver features including better keyboard navigation, such as quickly jumping between panels, improved screen reader support, such as adding aria-live tags to activities, and tons of little fixes to our high contrast themes. We’ll actively look for your feedback on GitHub. Instead of filling out a survey to offer a suggestion, you can now open Storage Explorer issues on GitHub. You can search existing issues, add comments to issues you fell are more important, share workarounds with other users, and receive updates when issues are resolved.